Da Nang (VNA) – The combination of tourism and sports not only creates the most favourable conditions for nations to get closer but also greatly contributes to a peaceful and prosperous world, Deputy Prime Minister Vu Duc Dam has said. 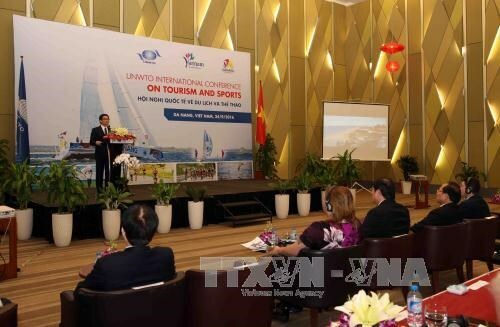 The Deputy PM made the statement at the International Conference on Tourism and Sports co-held by the Ministry of Culture, Sports and Tourism and the UN World Tourism Organisation (UNWTO) in the central city of Da Nang on September 24 within the framework of the fifth Asian Beach Games (ABG 5). Vietnam always defines tourism as a key economic sector, he said, expressing his belief that the conference, with the participation of experienced experts in the field, will help the country in particular have more new resources for developing tourism. Taleb Rifai, General Secretary of the World Tourism Organisation, praised Vietnam’s achievements in tourism and sports and said that Vietnam has been an emerging tourist country with many excellent destinations. Sports tourism is creating excellent opportunities for countries to increase their strengths, he said, calling on countries to protect the environment and conserve natural and cultural heritages for sustainable development. At the conference, participants discussed the trend of developing tourism in combination with sports activities, correlation between tourism and sports, and contributions of tourism and sports to sustainable development. Prof. Dr. Terry Stevens, an international t ourism consultant from the UNWTO, said that s ports tourism is an important drive for tourism globally and sustainable approaches are needed to make it an effective business.